It's essential to select the correct heater size for your Aquarium. A heater that is too small will struggle in cold rooms, while one that is too large will boil your livestock should it's thermostat fail prematurely. Please make use of the table below to selct the best heater solution for your Aqua One setup. Don't forget the 3 year warranty package on all our Aqua One heaters. It's always smart to have a spare heater on hand for use in an emergency. Don't forget that a broken heater will need to be replaced almost straight away in order that hypthemia does not set in amongst your tropical fish. In case of emergency, please call Aquarium Parts. We can normally despatch a replacement heater the same day. Likewise if you are unsure about which size of heater is best for your aquarium please call us for friendly advice. Find the correct heater for your aquarium model below. 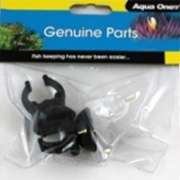 Select your new or replacement Aquarium Heater from the excellent new Aqua One Thermosafe range. Benefit from class leading features such as toughened glass, large easy to read temperature adjustment dial and the ability to run out of water, all backed up with a 3 year manufacturer's guarantee!